There are two types of FasTrak®​ transponders, both are free. Order yours from Bay Area FasTrak®. The new "FasTrak Flex®​" transponder has a switch that the driver can use to indicate the number of people in the vehicle. Drivers should set their FasTrak Flex® switch position before driving. Visit the FasTrak®​ website to create and set up your FasTrak® account. The best place to mount your transponder is on the windshield near the rear-view mirror. You can also mount it in the lower corners of the windshield. Visit the Bay Area FasTrak® website for more information about mounting your transponder. Drive through toll lanes and pay the toll automatically through the FasTrak® transponder. Tolls for solo drivers are collected electronically using FasTrak®​. The average toll rate on SR 237 for fiscal year 2014 was $2.00. The amount of the toll for single occupant vehicles will vary based on the level of real-time traffic congestion, usually between $2.00 and $4.50 during a typical stop-and-go commute, going up as high as $8.00 during high congestion. Carpoolers using an Express Lane need to put their FasTrak® tag in its Mylar bag to avoid being charged (The new “FasTrak Flex®” does not require a Mylar bag). If you need a new Mylar bag, call Bay Area FasTrak® at 1-877-229-8655 and speak with a customer service agent. If your FasTrak® transponder was not in its Mylar bag and you were charged a toll while carpooling, you should contact Bay Area FasTrak® at 1-877-229-8655 and speak to a customer service representative. Outside of carpool hours, all lanes will be open to all vehicles for free. If you have 2 or more people in your vehicle, or have a clean air vehicle with the proper decal, or are a motorcyclist and you take the 237 Express Lane, you need to place your traditional FasTrak®​ transponder in the Mylar bag. Without the Mylar bag, your FasTrak®​ account will be charged. With a FasTrak Flex® transponder, drivers move a switch to indicate how many occupants are in their vehicle. If you have an incorrect charge on your FasTrak® account, please call the FasTrak Customer Service Center to dispute the charge on your FasTrak® account: 877-229-8655 [Callers outside of California should dial: 415-486-8655]. During normal Express Lane operations, solo drivers can use the Express Lanes with a FasTrak® transponder. Solo drivers will be charged the posted toll amount, which varies dynamically based on the level of congestion. The minimum toll amount is $0.30, and the maximum is $8.00. When traffic is heavy on the 237-880 interchange, the Express Lanes can go into "HOV ONLY mode". This means the lane is no longer open to solo drivers paying the toll with FasTrak®​. During HOV ONLY mode, only vehicles with 2 or more passengers, motorcycles, and clean air vehicles with appropriate decals can use the Express Lanes. When "HOV ONLY" is posted on the toll message sign, a solo driver who enters the Express Lane can be issued an HOV lane violation citation of $491. 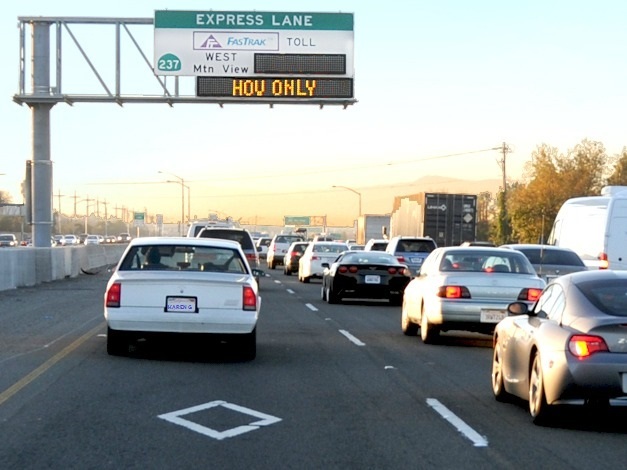 Solo drivers who enter the HOV/carpool/diamond lane too early, or fail to exit the Express Lanes promptly, risk being cited for a carpool violation by the California Highway Patrol (CHP). FasTrak Flex® is a new FasTrak® transponder that is convenient for carpoolers on I-580 in Contra Costa County and on SR 237 in Santa Clara County. It allows drivers to move a switch to indicate how many occupants are in their vehicle. FasTrak Flex®, when used properly, will allow drivers to use the Express Lanes and be charged the appropriate toll for solo drivers, or no toll at all for carpoolers and motorcyclists.